Mira Road, Thane-based Sri Chaitanya Seva Trust (SCST) provides holistic medical support to the underprivileged in the Mira-Bhayander belt through its 150 bed multi-specialty hospital, Bhaktivedanta. The hospital offers treatment at subsidized rate, or even free for people who cannot afford the cost of treatment after studying the patient’s financial background. Besides offering basic medical treatment, it runs a hospice centre for palliative care and a rehabilitation centre for drug addicts. The hospital’s cancer unit is an integrated centre for all cancer treatment. It also operates an institute of Nursing Education and Paramedical Science where certificate courses in nursing are provided. A spiritual approach is adopted while treating a patient, as the founders believe cure begins with the healing of mind. Regular health check-ups and health awareness drives are organised in the interiors of Thane district through its mobile vans. About 100 consulting specialists and 360 dedicated staff are employed with the hospital. 8,000 villagers were screened for Cancer along with the Awareness Program in remote areas of Thane. 225 Eye Camps were conducted in Mumbai and rural plus tribal areas in Thane. 8,100 dialysis were performed and Rs1.9mn worth free and concessional dialysis were done. Around 3,000 villagers were screened for Cataract, out of these, free cataract surgeries were performed for 1,210 villagers. 60 General Health Camps including those for Cancer, Senior Citizens, and school camps were organised round the year in Thane district. About 15,840 individuals were screened and suggested for required treatment. SCST posted total income of Rs46mn in FY13. 52% of total income in FY13 was raised through individual donors. Some institutions like Rata Tata Trust, Volkart Foundation, Lions Club of Juhu, ACC Ltd., GSK Pharma supported SCST. 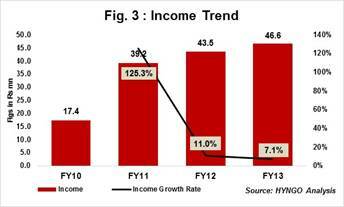 Interest income surged from Rs3mn in FY12 to Rs11mn in FY13 and was the second highest contributor to total income. The high interest income was on account of significant amount invested in fixed deposits in FY12. (Ref Fig 1). Expenses totalled Rs70mn in FY13, with 46% (Rs32mn) of total expenses incurred on depreciation. This allocation is highest in the health sector where average depreciation is 6%. The major proportion of total expenses is allocated to depreciation as the trust owns a multispecialty hospital with 150 beds and state of the art healthcare facilities, modern infrastructure and technology. Unlike other NGOs, SCST witnessed YoY deficits on account of huge depreciation. In FY13, expenses incurred on program activities accounted for 48% (Rs30mn) of total expenses. Of these, 24% (Rs17mn) were incurred on medical and surgical expenses and 20% (Rs13mn), salary and consultancy charges and 4% (Rs2.5mn) on travel. SCST’s spend on program activities surged to 94% after including 46% depreciation for the same year. (Considering depreciation as a part of program activities is an acceptable norm as the buildings and medical equipments in this case are directly used to treat its patients). Overheads accounted for 5% (Rs3mn) of total expenses in FY13 v/s health sector average of 14%. The expenses include administration expenses such as accommodation, postage, electricity charges, interest charges etc. (Ref Fig. 2). In FY13, the trust recorded investments of Rs96mn, a fall of 7% from FY12 (Rs103mn). The fall can be attributed to fixed deposits getting matured in FY13 Note that Investments doubled YoY and even after the slight decline in FY13, accounted for 28% of total assets. The funds set aside as trust corpus in FY13 were highest as compared to other NGOs in health sector. In FY13, SCST had set aside Rs339mn (98% of total funds) towards trust corpus; helping assure SCST’s ability to face unforeseen contingencies. 4-year income CAGR for the trust stood at 39% during FY10-FY13. It witnessed a marginal growth of 7% in FY13 as against 11% in FY12. The average YoY growth rate of the health sector was 18% in FY13. Self Sufficiency Ratio measures the ability of an organisation to meet expenses from its own funds and is calculated taking own funds as a percentage of total expenses. Own funds include donations, and interest income. 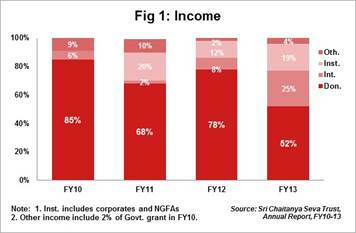 In FY13, the ratio was 99% as own funds were the major source of income for the trust. The trust has accumulated a corpus of Rs339mn whereas it has no general funds. This is because the trust has witnessed deficits in the past – years, which wiped away the general fund leading to accumulated deficits of Rs135mn in FY13. The trust raised 52% of income from donations in FY13. Though this increases vulnerability as the dependence on a single source is higher than desirable norm, it also indicates the confidence the trust has earned. The trust runs the Bhaktivedanta Hospital in a professional manner and finds it difficult to raise funds from many Corporates as they are equated with non-charity hospitals. Bhaktivedanta requires a minimum of Rs50mn each year to provide free medical aid to the underprivileged population in rural Maharashtra. The Board consists of nine trustees, of whom five are medical professionals, one is a finance veteran, and other three have attained self-realisation through spiritual process and are associated in serving the needy. No trustees are related to each other. The board meets once in every four months. SCST has a detailed, informative and updated website. The hospital publishes informative articles on diabetes and cancer in local newspapers of Mira-Bhayander. SCST is listed with Samhita and empanelled with Tata Institute of Social Sciences.